This page is intended for out of state boat buyers or overseas boat buyers who do not have the time or money to see the vessel for themselves and need a professional to inspect the vessel on their behalf to act as their eyes and ears. This is one of the services that I provide. I see there is a definite need and demand for this service. Many boat buyers, yacht buyers or investors do not always have the time or resources to travel across the country or the world to inspect every boat they are interested in buying. They search for an impartial and qualified person to be their eyes and ears and to submit them a thorough report on these prospective vessels. Often times remote buyers will look to hire surveyors or other people acting in this capacity. The difficulties some of these remote buyers run in to is receiving back scanty reporting results, to much time delayed in receiving the results of the inspection, and not receiving enough photos or videos to make an informed decision. I have searched Google to see who offers this service in Florida and in the United States and found there is very little on the subject for potential buyers to research. There is also little information available to find potential unbiased surveyors or technicians to conduct these type of inspections. I get many requests from all over the United States and overseas (in such countries as Australia, New Zealand, England, Spain, Mexico, Costa Rica, Peru, and in other countries around the world). These requests come from potential boat and yacht buyers looking to purchase vessels in Florida and elsewhere in the United States based solely on the marine surveyor’s report. What I do in my reporting that is unique from many other marine surveyors is all of my reports are extremely thorough. I check everything on board the vessel which includes the exterior and interior hull, all machinery, electrical systems, rigging, and documentation. I also will conduct a sea trial and if need be pull oil samples from the engines, generator, and reduction gears to have them analyzed for foreign substances to determine if the internal engines or reduction gears have been damaged. 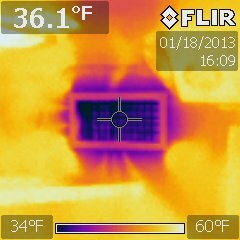 Thermal imaging is also a part of every pre-purchase survey I conduct and is included in the price of the survey. Compression checks can also be conducted on the engines if the client wishes or if I recommend this service to the client based on the results of the inspection and sea trial. 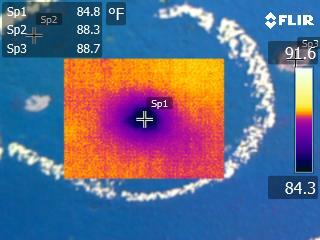 For those not familiar with thermal imaging, this is an amazing technology that I would not survey without. 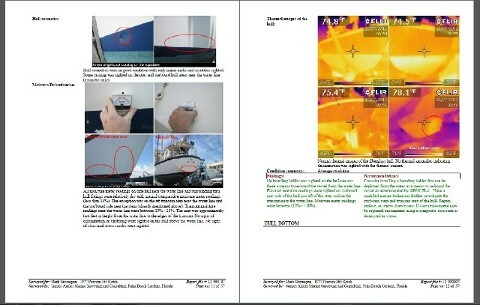 The thermal imaging camera senses thermal radiation (thermal radiation emits from all objects even in complete darkness; this is part of the light spectrum that can not be seen with the naked eye as seen in the thermal image photo to the left of water trapped behind a hull blister on the bottom of a fiberglass yacht). Abnormal anomalies can be seen without disassembling the vessel or its components. I find things with the thermal imaging camera I never would have caught using conventional surveying methods. Many items on board a vessel can be inspected for problems such as hull delamination, engine problems, engine exhaust leaks, tank leaks, electrical shorts, and even monitor the output of refrigeration and air conditioning air temperatures from the vents. 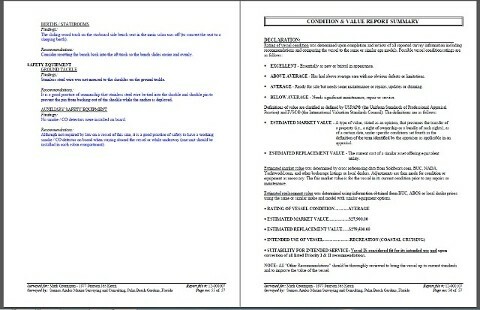 All of this information is compiled into a detailed report and sent to the potential buyer by email in typically 48 hours after the inspection. 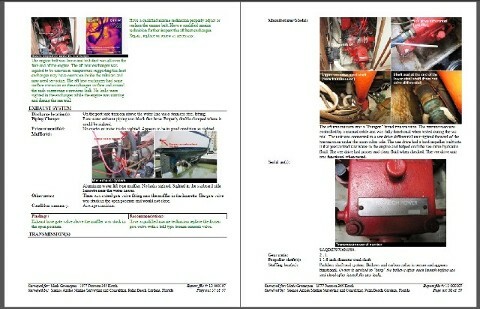 Most of my surveys are between 40 – 50 pages in length, separated by system or component, includes a color coded findings and recommendations section, and a fair market valuation based on the vessel’s year, make, model, condition, and geographic location (which is significant in vessel valuations). I also offer video walk-throughs of the vessel which is not an actual pre-purchase marine survey but more of a walk-through inspection of the vessel to determine if the vessel is worthy of continued interest considering the price offered for the vessel. These walk-throughs are photographed and digital video is taken of the walk-through. The video is typically uploaded to You Tube or via a secured file sharing website and can be securely downloaded by the client once they type in the password for the file. A list of findings are sent with the photos and the link to the video. A valuation range is also included in the email so the buyer can decide if he or she wants to further pursue the purchase of the vessel. The cost for this service is typically half the price of an actual marine survey and I also offer a significant discount if the client decides to move forward with the complete survey. In essence, for remote yacht or boat buyers, I am acting as the eyes and ears for them. I am a completely independent and unbiased marine surveyor. I do not work for yacht brokers or boat sellers. Approximately 85% of all of my business comes from the internet so I do not need referrals from yacht brokers. I am completely honest with all of my clients, the ones I am actually working for who pay me so they know the exact condition and value of the prospective vessel. Years ago I was duped from a surveyor (before I became a marine surveyor) that was tight with the selling yacht broker on a vessel that I was planning to purchase. The broker had refered him to me and I decided to hire the surveyor based on blind faith from the broker’s referral. When I met the surveyor on the day of the survey the broker’s logo was on the surveyor’s business card when he gave it to me (this is when I should have ran). The surveyor only showed up with a phenolic hammer, a flathead screw driver, and a pair of pliers (not kidding, he did not even have a moisture meter with him). 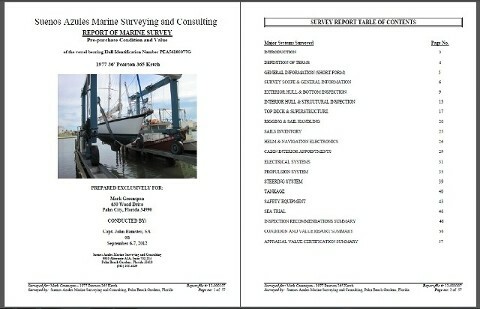 This surveyor was also a professionally affiliated surveyor with a nationally recognized marine surveyor organization. Long story short, he purposefully overlooked a leaking outdrive bellow (which I pointed out to him and he told me it was not a problem). The surveyor said I just had to replace the bellow once I bought the vessel. The outdrive ended up having emulsified gear oil (a mix of sea water and gear oil) inside the unit and the entire outdrive unit had to be rebuilt and all the bearings replaced less than two weeks after purchase (total bill for the outdrive was almost $3,500.00). As a practicing surveyor today, I know now that he knew this was a significant finding but chose to overlook it to push the sale for the broker. When I called this surveyor back to complain and question him more, he told me that he was not responsible for any damage after the date of the survey and said would not take any responsibility for it and abruptly hung the phone up on me. I never forgot how I was done wrong by that surveyor. Now that I am a marine surveyor I go into these vessels always remembering what had been done to me by that surveyor and think of myself as the client. I promised myself that I would never do that to any client, whether it would kill the sale or not. A marine surveyor worried about the broker or the sale is not serving the client’s interests and is not doing his or her job as a surveyor. We have to remain impartial and unbiased. We work for the client, or we are at least supposed to. I have seen many surveyors that have forgotten that in my travels. I suppose that is for another article pertaining to ethics (which that article content would be much larger than this article, I would have much to say on that). If you are a remote buyer and can not inspect the vessel for yourself or do not have the time or money to travel to see a prospective vessel, please keep me in mind and know that I conduct this service (complete pre-purchase surveys or vessel walk-through inspection services) anywhere in Florida, the United States or the Caribbean for potential buyers. I provide this service for some overseas yacht investors that will send me across the United States several times a year just because of the quality of my marine survey reports. One overseas client who was a yacht investor (who has used my services several times) once told me that he did not mind paying the extra out of state travel fees because trust was everything with him and he was buying these yachts solely off of my marine survey reports based on my detailed report, findings, recommendations, photographs, and videos. That was a very nice complement to receive and I felt good that I had earned that much trust and confidence from him. I can provide references upon request. Sample marine survey reports are also posted here on my website so you can see the quality of the type of report you would receive. You can view these sample marine survey reports by clicking here. My full list of experience, education, and qualifications are listed on my "Linked in" profile here. Feel free to contact me if you may have any questions about remote buyer marine surveys or marine walk-through inspections. I will be more than happy to answer any questions or discuss this service with you.